umbilical cord the structure that connects the fetus and placenta; it is the lifeline of the fetus in the uterus throughout pregnancy. About 2 weeks after conception, the umbilical cord and the placenta are sufficiently developed to begin their functions. Through two arteries and a vein in the cord, nourishment and oxygen pass from the blood vessels in the placenta to the fetus, and waste products pass from the fetus to the placenta. Soon after birth, the umbilical cord is clamped or tied and then cut. The part that is attached to the placenta, still in the uterus, is expelled with the placenta. The stump that remains attached to the baby's abdomen is about 2 inches (5 cm) long. After a few days it falls off naturally. 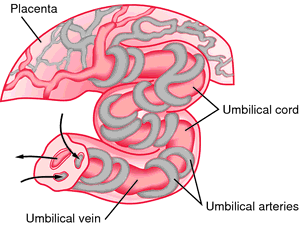 Umbilical cord with umbilical vein and umbilical arteries. 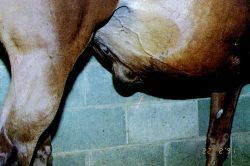 From McKinney, 2000.
umbilical hernia protrusion of abdominal contents through the abdominal wall at the umbilicus, the defect in the abdominal wall and protruding intestine being covered with skin and subcutaneous tissue. Called also exomphalos and exumbilication. During the growth of the fetus, the intestines grow more rapidly than the abdominal cavity. For a period, a portion of the intestines of the unborn child usually lies outside the abdomen in a sac within the umbilical cord. Normally, the intestines return to the abdomen, and the defect is closed by the time of birth. Occasionally the abdominal wall does not close solidly, and umbilical hernia results. This defect is more likely to be seen in premature infants and in girls rather than boys. It usually closes by itself. Coughing, crying, and straining temporarily cause the sac to enlarge, but the hernia never bursts and digestion is not affected. If the defect in the abdominal wall has not repaired itself by the time the child is 2 years old, surgery to correct the condition (herniorrhaphy) can then be performed. 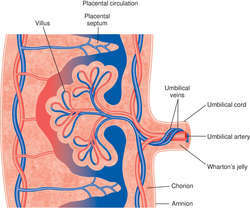 the definitive connecting stalk between the embryo or fetus and the placenta; at birth it is primarily composed of mucoid connective tissue (Wharton jelly) in which the umbilical vessels are embedded. The flexible cordlike structure connecting a fetus at the navel with the placenta and containing two umbilical arteries and one vein that transport nourishment to the fetus and remove its wastes. a flexible structure connecting the umbilicus with the placenta in the gravid uterus and giving passage to the two umbilical arteries and the umbilical vein. In the newborn it is about 2 feet long and ½ inch in diameter. First formed during the fifth week of pregnancy from the connecting stalk, it contains the yolk sac, stalk, and allantois. Also called the chorda umbilicalis, funiculus umbilicalis. See also allantois. Synonym(s): funiculus umbilicalis [TA] , funis (1) . The nutritional, hormonal and immunological link between the mother and the fetus during pregnancy. The umbilical cord arises from the PLACENTA and enters the fetus at the site of the future navel. It carries two arteries and a vein that connect to the fetal circulation. the cord that joins the embryo of placental mammals to the PLACENTA (1) consisting of two arteries and one vein supported by connective tissue. 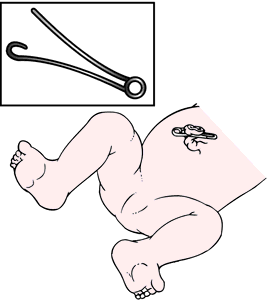 The cord is usually severed at birth, the part connected to the baby degenerating, leaving a scar, the navel. The blood vessels that allow the developing baby to receive nutrition and oxygen from its mother; the blood vessels also eliminate the baby's waste products. One end of the umbilical cord is attached to the placenta and the other end is attached to the baby's belly button (umbilicus). Umbilical cord blood stem cells have the potential to grow into many different kinds of cells. Effect of human umbilical cord blood celts on glycemia and insulitis in type 1 diabetic mice. However, more doctors are now turning to umbilical cord cells. Unexpectedly, the scientists found that one of the most abundant persistent organic pollutants found in umbilical cord plasma was not an HO-PCB but the wood preservative PCP. The study's findings, which were reported Wednesday by the ministry's investigative commission on endocrine disrupters, showed that dicyclohexyl phthalate (DCHP) was detected in the umbilical cord of one of five infants studied. Arterial and venous umbilical cord blood samples from 320 consecutive neonates were drawn in preheparinized tubes immediately after birth (cat. I don't mean to offer every child an electronic umbilical cord to home, but perhaps to give the parent an umbilical cord to camp. Umbilical cord torsion has been established as an uncommon cause of intrauterine fetal demise. The umbilical cord may have inflammatory infiltrates around vessels, a condition known as necrotizing funisitis (4,6). Umbilical cord blood also has reduced immuno-reactivity and thus, lessens the risk of rejection by the recipient's immune system as well as graft vs.